You are currently browsing the category archive for the ‘infant death’ category. For the last several months I have been wearing a very special necklace that I picked out from JewelryKeepsakes.com. I am not much of a jewelry person, so when I do wear something it is usually pretty special to me. This particular necklace can also hold a small amount of personal remains of a loved one. I have seen these before and honestly wasn’t sure how I felt about it. But now that I have one I am very glad I own it. It is my preferred piece of jewelry–It is stylish, well made, and nobody can tell what it holds inside. Basically, it simply looks like a very pretty piece of jewelry. Nobody knows it holds a small part of my son’s remains unless I tell them…and I don’t offer that information. The necklace came with a small funnel and toothpick to help the flow of ashes into the small opening. I had no real issue with the process of filling the necklace. If a larger piece of remain did not fit through the funnel I was able to push it out and try a different portion of ashes. The toothpick wasn’t extremely strong, though, and it did break. That was the only issue I had with filling the necklace with some of Dekar’s remains. The opening on the top of the necklace is closed with a little screw. This shut tight since I was careful to not overfill. Originally I did not use the adhesive product that was sent with the necklace. It seemed to me the screw was secure so I did not think it needed the extra adhesive. However, after wearing the necklace almost daily for a few weeks I found myself checking the necklace regularly, making sure the pendant was still in place! I decided to buy some strong adhesive and securing the screw permanently. Once I secured the screw with some adhesive I feel more peaceful, knowing the pendant cannot accidentally come loose. The chain itself is something I need to have fixed. The clasp is very difficult to attach to the other end as the opening is quite small. I have contacted the company and was assured this can be fixed/replaced. I just haven’t done it yet due to the craziness of life lately. I really love this necklace and am so glad to own it. 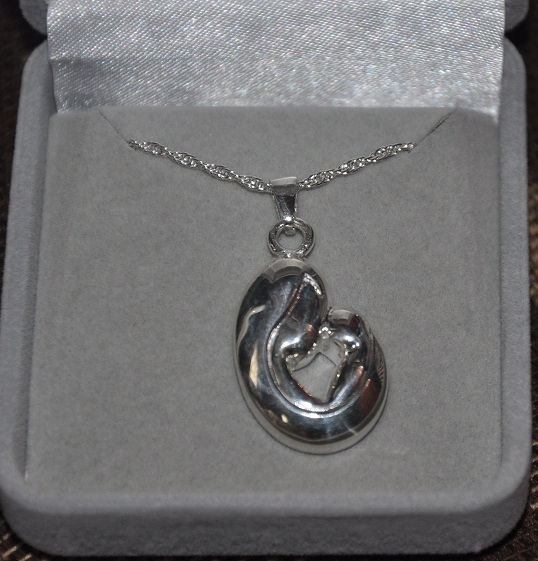 Even if I didn’t have some of Dekar’s remains in the necklace I believe it would be a favorite necklace because of the special picture of a mother cradling her child’s head. As far as the service itself from JewelryKeepsakes.com, I couldn’t be more pleased. The shipping was prompt and the communication was excellent. 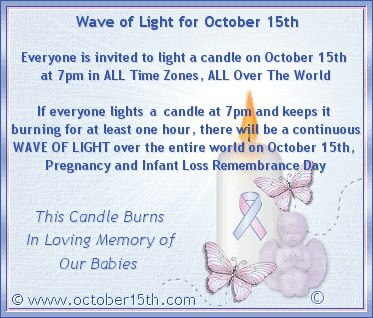 October 15th is Pregnancy and Infant Loss Awareness Day. and the babies who made it home, but didn’t stay. I will have a whole new family to join up in heaven!–Dekar and six (known) miscarried babies. A candle will be lit at 7 pm in honor of them and all babies gone too soon. A version of this poem was shared in a Now I Lay Me Down To Sleep parent newsletter. Although this is not my writing, I am posting this and dedicating it to the mothers who have lost a child and have no living child at home to hug and hold on this Mother’s Day. CAN YOU BE A MOTHER WHEN YOUR CHILD IS NOT WITH YOU? But God can you be a mother when your baby is not with you? Some people who stumble across this site may wonder “why”? Why have a site dedicated to a lost baby? Well, for me, I started it as an easy way to share Dekar’s Now I Lay Me Down To Sleep video. It also was an easy way to share his story without having to send it out individually. I didn’t have the energy for that. Then I just kept adding posts here and there. Some I have removed, but most I have kept posted. When I look back and read some of the stuff I posted, honestly…..I cringe. I don’t really like what I wrote, or the tone I wrote it, or the way I conveyed my feelings. But I keep them there because it is all real. I could go back and edit things, but I wrote what I wrote and I stand by the words I wrote, even if they aren’t pretty or eloquent. If I changed anything now, I would take away the reality of what I felt at the time. Grief is a weird thing. Some days I could feel fine and felt “over” the loss of Dekar, and then the next day I could feel so sad that it felt like a truck hit me. So my up/down, nice/not-so-nice posts are all real. We still have a Dekar Day every month. We break out the ice cream or some other too-sweet treat and remember Dekar’s short, but full life. My one son never made the connection that we did this on the 27th because Dekar was born on the 27th….but now he knows. 🙂 Today is that day!–We will likely go to a store and pick out whatever flavor strikes our fancy. Sprinkles have become a frequent occurrence of the memory celebration. I have a box of Dekar’s photos that are still not in albums. I requested that they all be printed in order–from birth to the last moments–so that the albums would show the flow of his life. But I can’t do it. I haven’t even opened the box to look at the photos. Why not? I don’t know. I just can’t do it. For my birthday I requested some photo albums specifically for this purpose–thinking that would help me make the next move. Well, my birthday was in October, and the albums and box of photos still sit. Someday. 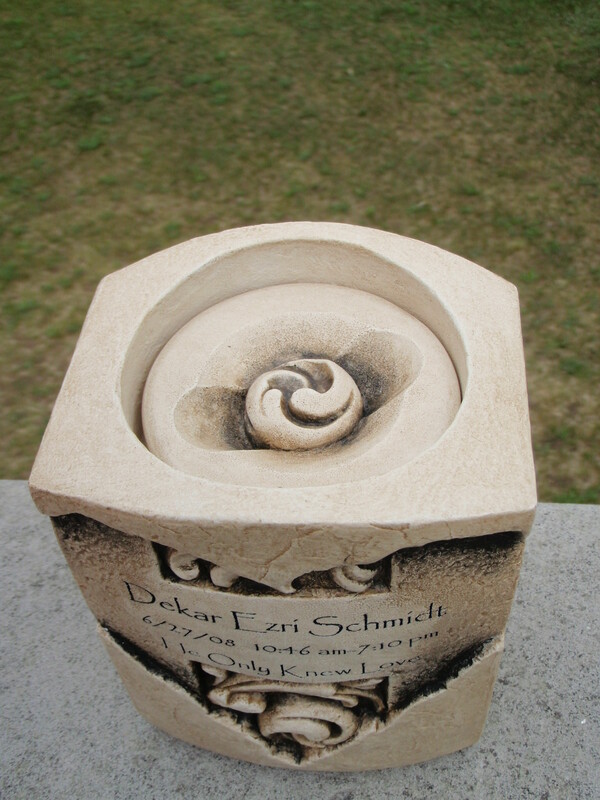 Dekar’s ashes are still in the box that the funeral director gave me. 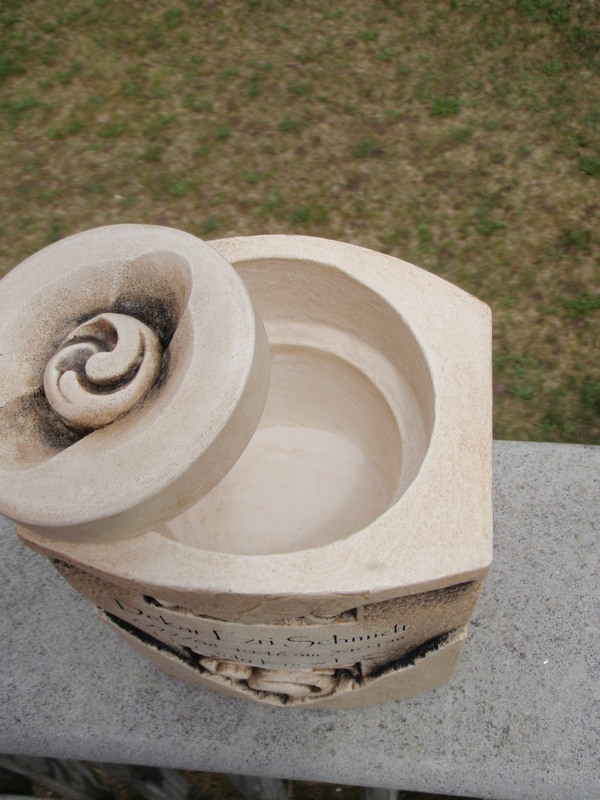 I thought that once I got the perfect urn that it would not be a hard thing to have the ashes placed in the urn. Wrong. The urn sits in my memory cabinet, and the ashes sit in the cardboard box in my closet. It’s another thing that will happen Someday. 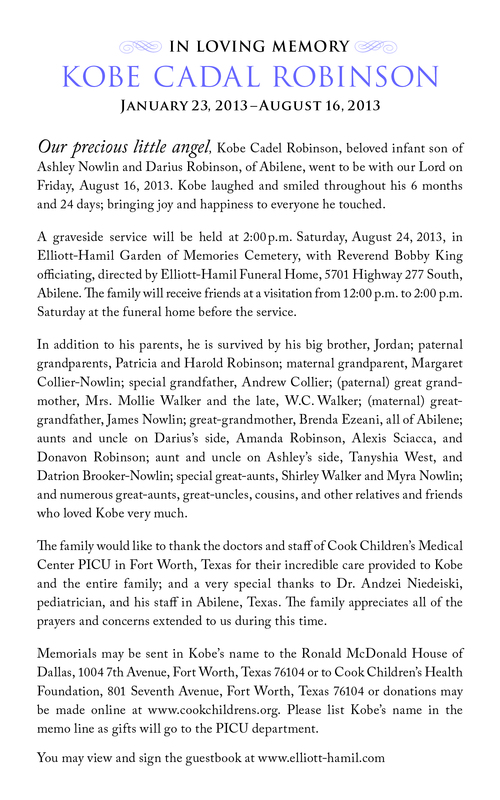 I keep this site up now not so much to share Dekar’ story or video, but because many people search for baby obituaries. I know how helpful that is for them–it was in the reality of what I was going through that I saw the need to have a reference site of baby obituaries. I also keep this site up because it was, and still is, my reality. I also know there are others going through their own reality that may be similar to mine: I was pregnant, Dekar was given a diagnosis of “incompatible with life”, I hit the grieving stage from the moment of diagnosis, I carried to term, I wondered if Dekar would open his eyes and meet his family, I said hello, I saw him smile, I said good-bye, I wrote an obituary, I gained too much weight while pregnant, I encountered kindness, sincerity, coldness and indifference. Put a million other realities in there, and that is my story. 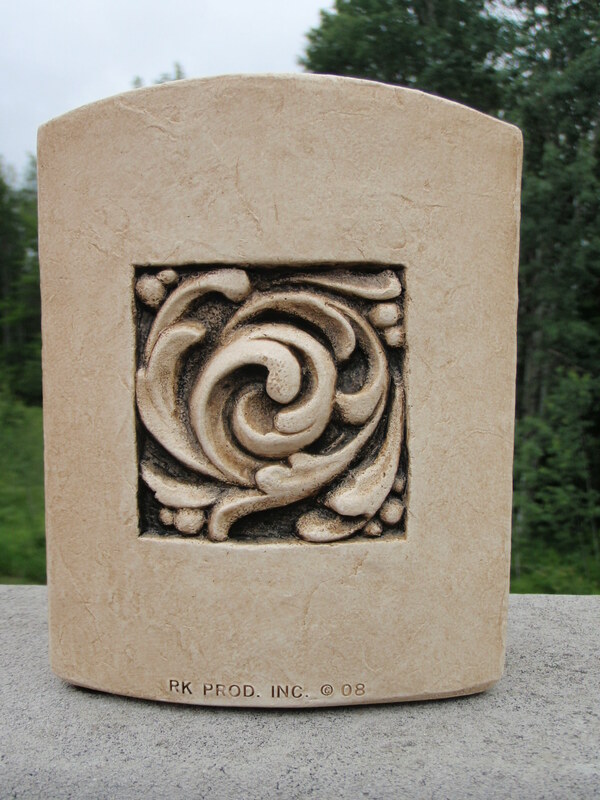 Maybe you can’t put your photos in albums, or your baby’s ashes in the urn. Or maybe you are just the opposite and look at the photos every day and light a candle by the urn every morning. Our realities are the same–just dealt with in a different way. There is no right or wrong. All I know is that I would gladly share an ice cream with you, listen to your story, and love having the opportunity to share mine. After getting Dekar’s diagnosis my husband’s co-worker/friend gave a pot of beautiful roses to us. I started calling them Dekar’s Roses. At one time last summer there were nine beautiful blooms on one of the plants–one for each of my children! These pictures were taken last year. The month of Dekar’s birthday has been funky for me the last two years. If you have lost somebody special in your life you may understand. For me this means I may be more somber and melancholy. Other times I’ll want to keep busy and do something productive to pass the time. Some days I’ll notice I’m simply out of sorts–in a funk! As time has gone on I’ve recognized this as my way of working through the grief and acceptance of losing Dekar. These things don’t catch me off guard or make me question myself as they used to. I just take them as they come. Grief is a weird thing and definitely different for everybody. Since this is Dekar’s birthday month I am going to post a new picture or memory of Dekar when I feel the need to help me work through the “funk”. All of a sudden, in the midst of a busy morning, I got very sad. Our family will be leaving on a vacation and I feel like we are leaving Dekar “behind”. It’s hard to know what to say to somebody when their precious baby dies. While we received many lovely, heartfelt sympathy cards, this one has always stood out to me. The lady hesitated to give it to me because she was worried it was “too late”. 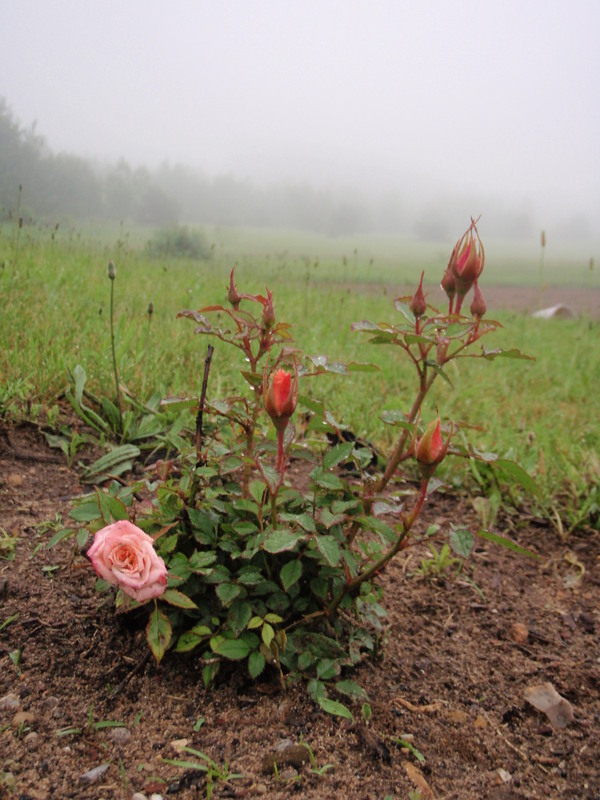 (It is never too late to recognize somebody’s loss, whether it be in word or deed.) I was so blessed when I read this even though it was given to us a couple months after Dekar’s departure. Though it has been a while now, there is still nothing I can say to ease your loss of little brother and son, Dekar. Our prayer is that time will make the wound less raw and the pain less intense. The time you spent with Dekar was beautifully spent in such a meaningful way that it touched our hearts. The sharing of your story and of that time gave even more meaning to Dekar’s life as others use it to reinforce their strength to face similar conditions. Our prayer, too, is that Dekar’s absence will not be sorely felt and that one bright star will shine over each of you to remind you that one day the wound will be made whole again when your continued faith in God, our Loving Father, will bring us all together again with our missing loved ones. Then, without pain or sorrow, we can love, and be with one another for eternity. I emailed this when we had our final diagnosis about Dekar. There was much uncertainty for about a month–not knowing what was going on with our baby when all had seemed to be going fine. I can vividly remember the raw emotions that flowed when the doctor called with the final diagnosis. “Our baby boy has been diagnosed with a chromosomal abnormality called Trisomy 18. It is caused by the presence of three — instead of two — copies of chromosome 18 in a fetus or infant’s cells. What this means is that the prognosis for the baby’s survival is not good. Along with (and/or because of) Trisomy 18 he has a heart that is not formed correctly (most likely only two chambers, possibly three) along with a brain and kidneys that have not formed correctly. The dr. says there is a small possibility the baby could be born live but if he does, he would not likely live long. There is also a very good chance that he will die before birth. Thankfully, he is not in any pain now. We have named him Dekar (pronounced Decker)–a name we picked out a while back. It means “pierce”. He certainly has pierced our lives–with unexpected pain, but mostly with an overflow of love for him. His tentative middle name is Ezri, which means “helped of God”—and God is truly his only hope now. Please pray for peace for all of us. There is still much uncertainty in the coming days and it is all in God’s hands. Side note: We have never found out the gender of any of our other babies before birth. Dekar was the only one we requested to know the gender since we felt it was important to have a definite name for him beforehand. We did use the name Ezri–it was very fitting, and still is. We know God was with us through the whole thing, and even prepared the way before we even knew anything was wrong. God gave the OB/GYN “eyes to see” and the wisdom to check into something that seemed like a small thing—the baby seemed to be growing slower than my other babies…That actually is a whole ‘nother story in itself. After hearing the news of the final diagnosis we met with doctors several more times to find out exactly what was going on with Dekar and started formulating a birth/death plan–otherwise known as “Praying for a miracle, planning for a funeral”! I didn’t get out of my pajamas for several days after getting Dekar’s diagnosis–I am thankful that God doesn’t care how I look or smell when I cry out to Him. I am thankful that God understands the depth of the heart cry “Oh God, help me.” That was all I could pray for a while. I am thankful that God planned everything so perfectly the day that Dekar was born. When I find myself worrying about something I can rest in the fact that God is in control and that God cares. I have the very real experience of Dekar’s eight hours on earth. God took care of details that I did not think of and certainly couldn’t have planned. If God did that for me then, He does it for me now. It helps calm me in times of stress. I am thankful that I spoke to Dekar. When I looked in his face and saw his poor color I was silent–he had the face of death. All I could think was “This isn’t right! This isn’t how it is supposed to be! Dekar is supposed to be alive to meet his brothers and sisters!………..” and while I was fretting, I remembering hearing a gentle voice say, “Speak to him. Dekar knows your voice.” And so I did. I said, “Hey, Dekar.” I didn’t know what to say–but as I kept talking he moved his head and attempted to open his eyes, looking for the voice that he heard for months while growing inside of me. Then he attempted to cry. The nurse told me afterwards that was a miracle–usually babies in Dekar’s situation continue to deteriorate more and need medical intervention to respond. But my voice, and my husband’s voice, was what Dekar needed. I am thankful I didnt’ give into my grief, listened to the beckoning, and spoke to him. I am thankful that although I don’t remember highlighting that verse, that God used it as a reminder for me today that He cares about Dekar and that he has been spared from evil and finds rest as he lies in death. I am thankful that although Dekar is not here with me, he is in total peace and at rest in Heaven. I am thankful for the experience. I am thankful there were people to support me and help guide me with decision-making. I am thankful that I can now extend that same kindness to others. I am thankful I have a new perspective and a new hope. Happy Thanksgiving, Dekar. Tomorrow I’ll have some ice cream, remember the beauty of your short life, and be thankful for God’s continued faithfulness. Inside where the cremains (or other momentos) can go. Top can be sealed permanently, if desired. When given the diagnosis of Trisomy 18, we were told Dekar only had a 50/50 chance of making it to a live birth, and few babies who survive make it to their first year. Joey Pagac’s first birthday is much more than a milestone. To her parents, Bruce and Lisa, it’s a miracle. Where they are is the maternity ward of Chestatee Regional Hospital, where little Joey is wearing a tiny birthday hat as she’s passed back and forth between adoring nurses and cooing doctors. It was a little more than a year ago that Joey beat the odds by emerging into the world despite her diagnosis of Trisomy 18. “Trisomy 18 children generally have a whole host of issues,” said Lisa. These issues can range from holes in the heart to non-functional kidneys. The disease is so severe that approximately 95 percent of babies that are diagnosed with it don’t make it through delivery. Others rarely live more than a few hours after birth. Naturally, when the young Murrayville mother found out her child had the vicious disease, she was crushed. After trying for eight years to conceive, Lisa and Bruce had turned to in vitro fertilization and watched Joey develop from an egg. So when the results of an early test came back, Lisa felt as though she already had a daughter. Chestatee nurse Ellen Wren says the gutsy move of Lisa and Bruce is to be admired. “I think what was so amazing was she was given a choice,” said Wren. Joey’s pediatrician Dr. Stephanie Corn agrees. Joey arrived two weeks late. And the delivery process was brutal, says Lisa. She credits Dr. Robert Brown for getting her child through it. Normally Trisomy 18 babies need breathing and feeding tubes to live. Joey requires nothing like this. Instead she has spent the past year growing and developing with very few complications. And, in turn, Lisa, Bruce and Joey have grown into a family. “I’m just happy,” says Bruce. Joey is too, adds Lisa. After returning home from the hospital, Lisa says she learned that she wasn’t alone in her plight when she met up with other parents of Trisomy 18 children on Facebook. “After connecting with a bunch of people I found out, ‘Gosh, I’m not the only one.’ There’s so many other people out there,” she says. In turn, Lisa says she hopes she can provide comfort to any parents-to-be who find themselves in a similar situation. As she says this, proof of this hope is still wearing a small pink birthday hat and making the rounds among a beaming hospital staff. Charlize lived for 58 beautiful days! 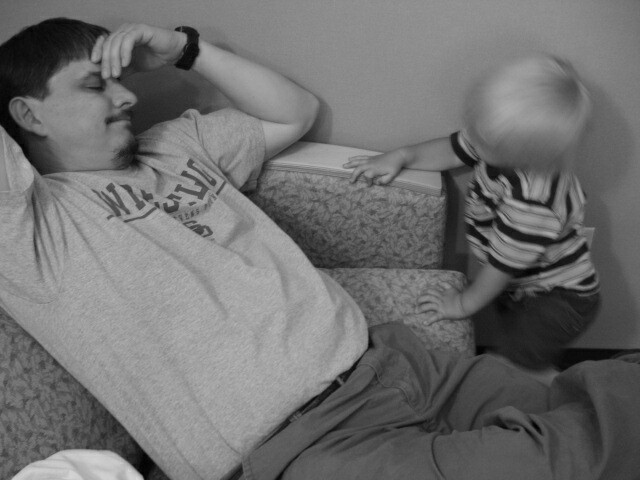 Faces of Trisomy are portraits by Jude Wolpert taken at SOFT conference in Roanoke, Virginia July 2009. The purpose of awareness is to encourage others to see our children as just what they are, kids and young adults, and not as their diagnosis. Receiving a diagnosis of Trisomy is hard enough for any parent. Today with medical advances, early intervention, therapies and inclusion in education we can make others aware of the possibilities for our children given the chance. Darcy Anne lived for 15 days! You can find other Trisomy 18 babies on YouTube. Do you have a Trisomy 18 story of hope to share? Please send me your story through the contact link at the top of the page. 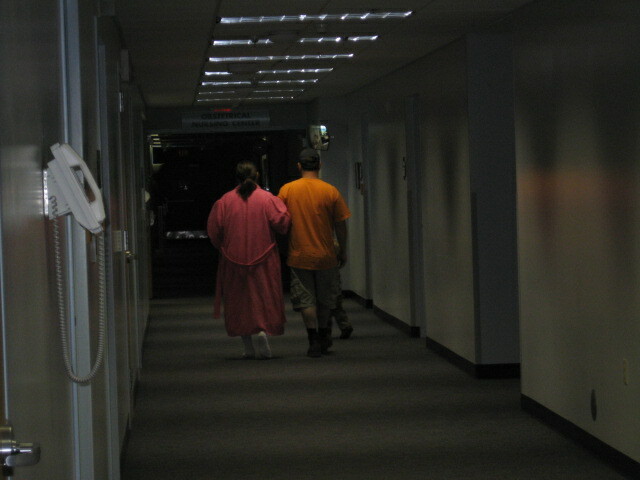 I was going through pictures today and thought these two were sweet–my husband and I (and one of our little guys) walking down the hallway the day after Dekar passed on. My oldest daughter took them. 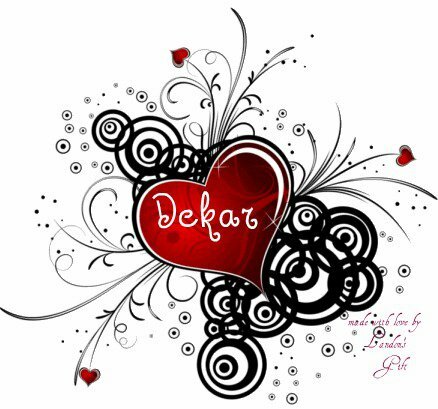 Sometimes I wonder, Dekar….Does anybody else think of you every single day, the way I think of you every single day? Sometimes I remember you with a smile, sometimes with a tear. Sometimes I just look at your picture and I wonder…. What is it like to be in heaven? Do you see me? Do you see your brothers and sisters and your dad? Do you have ice cream with us on “Dekar Day”? I like to think so, but I don’t know. It’s a thing we do on Earth… So, I just sit and wonder…I like to think that you bring out ice cream and share it with all the other babies who left their moms and dads too soon. I say “too soon” because of me–not because of you. I feel the void, the absence of your presence–the awareness of the life that was so short, yet impacted me so greatly. I really don’t expect anybody else to remember the way I do. 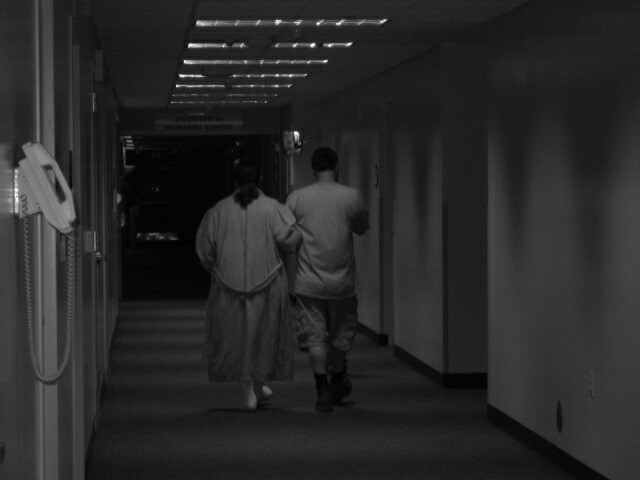 I am your mother, and from the moment I got the news of your diagnosis I grieved the loss of you, my son. Is it possible to have a life selfishly centered around another person? Because if it is, I’m guilty–my moments, seconds, minutes, hours, days and weeks became “all about you”. I wanted every moment to count. I was the one planning for your arrival–knowing full well it was to say “good-bye”. You were with me–you were the REASON for every moment of my planning, my grieving, and my tears. You were the reason for the ice-cream that was eaten all too often….When I saw an outfit hanging at Target, I knew it was meant for you. Even if you would only wear it once, I knew it was still meant for you. I had the privilege of the all-encompassing “connection”….feeling you kick and move. Even when your brothers and sisters felt you move from the outside, it still wasn’t the deep, full movements that I felt–the squirm that radiated through my whole being. When I would feel the jabs I would wonder, “Is this the last time I’ll feel him move?”….. I’m thankful the movements continued. Did you know, Dekar, that I’m not a big ice-cream freak, but when I discovered that YOU seemed to enjoy it, I ate it as often as I could? Did you know that you helped make me into a quite “full-figured” woman? 😉 It’s okay with me–every extra ounce of weight I gained because of eating too much ice-cream was worth it. I know God’s timing is perfect and I know you are in Heaven–in perfect peace and surrounded by only love. I wouldn’t want to take that from you…but I do wonder what it is like and I wish I could see you there. I think I might just have a Brownie Earthquake and think about it–Brownie Earthquakes made you kick and that made me smile….and tonight I need to remember that feeling. So after having ice cream with the family, I will go off alone and indulge and wonder. It’s what I need to do today. 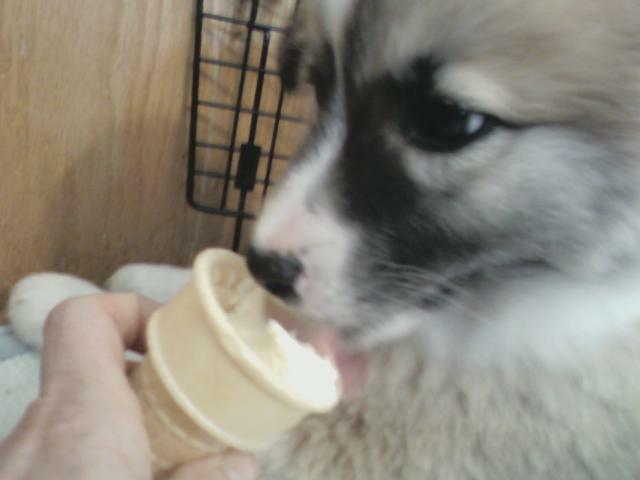 Our new pup Jazzie enjoyed her first Dekar Day ice-cream cone. 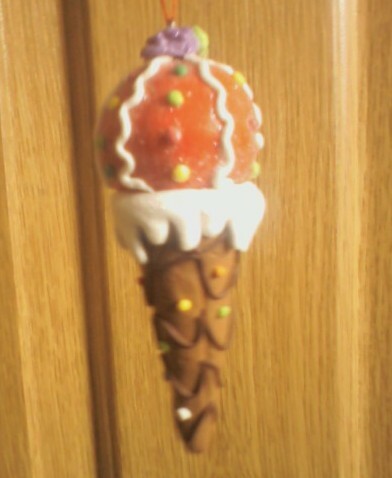 I don’t usually take pictures of ice-cream, but it was worthy of being remembered–as silly as that may sound, and even I think it is silly to take a picture of ice-cream. I want to remember the ice-cream mostly because I remembered you so deeply that day. Dekar, I had watched your videos and looked at your pictures as much as time allowed on what would have been your 22nd month on earth…but it wasn’t your 22nd month on earth. It was your 22nd month in heaven. As much as I love the fact that you are in heaven and that I will see you someday, I equally hated that you are in heaven instead of with me—I wanted to be with you NOW. The ever shifting emotions connected with grief continue to bewilder me. How can I go from smiling at your picture to breaking down in tears that don’t stop….how can I appreciate the time I spent with you and then be sad that I didn’t do “more” with the time that I did have? How can I hate that I went through this yet would never give up the experience for anything in the world? My relationships have changed, my views have changed. Carrying you and losing you has forever transformed me to my very core. I am waiting for the time when I can be at total peace with this “new me”. Some days I think I am there, but then I learn of a new loss that I didn’t realize I suffered…a changed or lost relationship, a lost dream. This was one of those days that I evaluated and reevaluated. I looked at your face and little body and wondered what else will my eyes be opened to and my heart be transformed by? It’s like a constant waxing and waning. Some, I think, have the notion that the death of a baby is something that will be forgotten and only remembered on occasion. They have no way of understanding that it is something that is right there all the time. 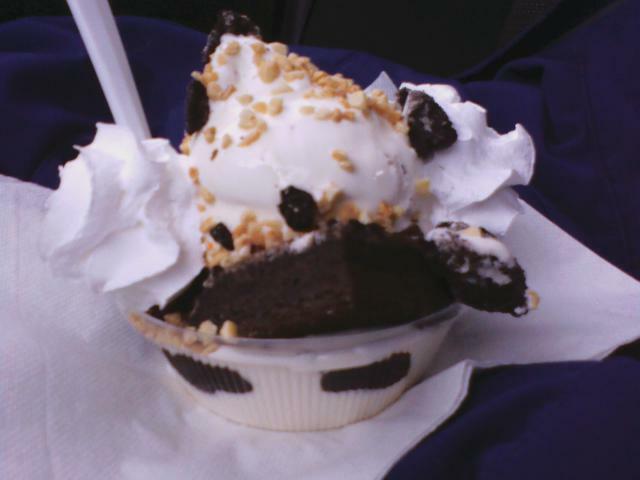 When I ate the Brownie Earthquake that evening, I ended the day with a smile. I remembered your life. I thought of your little sounds and the smile you gave us right before you passed on. You only knew love and you only gave love. And your life keeps on giving–I will never be the same. Learn from my mistake: Save EVERYTHING! The other day I spilled coffee on my laptop. From what I can tell, the laptop is dead. With that laptop I had journalled my pregnancy/experience with Dekar and that is where I kept all of my photos. I never backed up these things. I never saved the pictures of when I was pregnant with him. Stupid. Stupid. Stupid. Thank God I had my dh save the videos of Dekar’s birth and passing and my NILMDTS photographer gave me a copy of all of his photos. If those were lost………..I don’t even want to go there. Please do not make my mistake. If you stumbled upon this site because you recently lost a baby you are likely in a state of grief and not thinking as clearly as you usually do–if you are reading this, please stop now and save anything that you have on your computer that you don’t want to lose. Photos, videos, journals, emails–anything that you don’t have backed up on an external source. If you don’t know how to do it or it isn’t in your area of comfort, find somebody who can do it for you. You may be the parent, sibling, spouse, or friend of someone who has lost a baby or will lose a baby……If you are in the position to offer assistance to a person who could use some extra support in this area, please do it. It is a big deal–believe me. For some people this computer stuff comes as second nature. Not for me. I kept *thinking* of backing everything up and never did it. Add to procrastination the lingering fog of grief and it’s a bad combination. So many memories of all my children are possibly gone forever…..and I should have known better. One stupid spilled cup of coffee later and here I am……Yeah, I’m beating myself up and mad at myself—-I’m also extremely sad. I can’t go back and change anything, but others can learn from my mistake. I’ll be contacting a professional to check my hard drive–I’m praying it can all be retrieved. 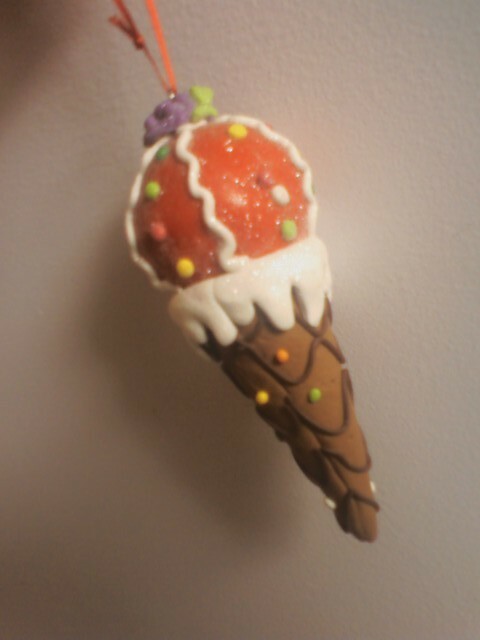 Dekar’s Memorial Ornament, 2009–It’s so perfect! Cortney and I went shopping on black Friday. 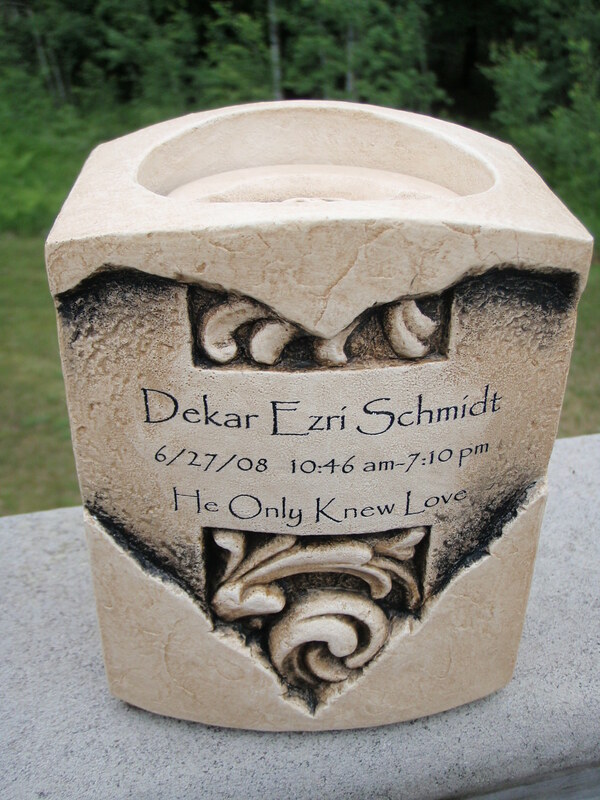 After the major shopping was done I wanted to relax a bit and look for a memorial ornament for Dekar. I had an idea of what I might like, but nothing was set in stone. Cortney looked with me, and it was so perfect when he showed me the ice cream cone–it even has sprinkles! Dekar smiled shortly before passing on. I was holding him as he was taking his last breaths and he looked at me and smiled. It was such a blessing and equally amazing that my daughter actually caught the fleeting smile with her camera! Whenever I see Dekar’s smile I remember how I felt -it was a bittersweet feeling of believing he enjoyed his time on earth and yet he knew it was his time to go Home. His smile was a “thank you” and a “good-bye”. Teresa Howell offered her artistic talent to make the above memorial snowglobe for the holiday season. Thank you, Teresa! There are some pleasant memories from the day we welcomed Dekar into the world and tonight I am happy that I get to share one of them. 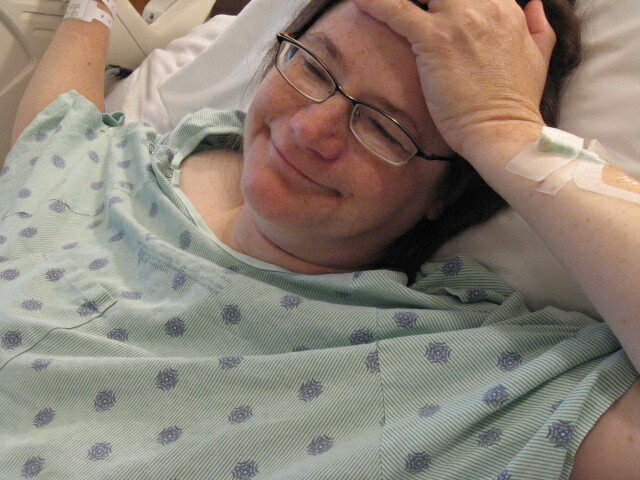 The day after Dekar’s birth and passing I watched the video captured in the delivery room. Of course I was very absorbed with Dekar that day, and didn’t process all of the other things going on. But one thing that caught my attention in the video was the kindness shown by the anesthesiologist, Mike. He made me feel at ease from the moment I met him. I noticed when I would ask him questions his response would always be friendly, calming and kind. During the c-section I was in a position with one arm somewhat strapped down with the blood pressure cup, and the other arm was free. My husband was trying to hold Dekar in my view , but I can’t really see him too well because Dekar’s swaddling blanket was in the way. With one arm bent weird and the other strapped down, I couldn’t do too much about it and I didn’t even think to ask Cortney to move the blanket. Mike apparently notices this, and smooths out the blanket so I can see Dekar’s face better. I didn’t notice this at the time, and I’m not sure that Mike was even aware of what he did—but while watching it afterward it really struck me as a kind and compassionate thing to do. He was doing his job, which was apparent in the video, but he was also simply showing human kindness during a hard situation. That was no small thing. After some time had passed after Dekar’s death I sent out letters telling Dekar’s story and wrote personal thank yous to those who touched me in a special way that day. One of them was to Mike, and I mentioned how I appreciated his display of kindness in the operating room. Adjusting a blanket may seem a like a small thing, but when you don’t know how many moments you will have to see your son’s face, every moment counts. Fast forward to this last week. I was setting up a booth at a Mom-to-Mom sale and a homeschooling father comes up and says hello. I recognized him from a field trip we had recently attended. Something about him seemed familiar, but I couldn’t place where I saw him before. When he reintroduced himself as the anesthesiologist from the day Dekar was born, I can’t express in words how this made me feel. I didn’t recognize him without the scrubs on–but this was Mike! He hadn’t recognized me either, but after talking to his wife he made the connection that I am Dekar’s mom. During a hard and sad situation, there were some glimmering lights, and Mike was one of them. To see him again in a normal everyday situation, and learning that we have something in common (homeschooling) made me smile even more. It made me realize once again that it isn’t always the “big” things that matter. All Mike did was adjust a blanket. But that one small effort is forever ingrained in my memory as one of the kindest actions I have ever experienced in my life.